Arkansas - not Alpine. Tessin habit* natural smoky quartz crystal has 20 termination and prism faces! 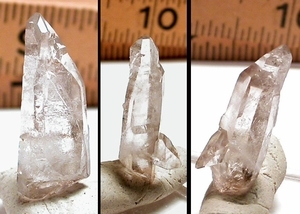 A gem grade [A+] miniature of 5/16x 1-1/4" tall, there is a classic penetrator crystal as well of 1/4x 3/8". Each has a termination fleabite you may need a loupe to notice. Recordkeepers, growth craters. *A crystal whose prism sides grow tapered towards the tip of the crystal by alternating steep rhombohedral and m prism faces is said to have a Tessin habit (named after the Swiss Kanton Ticino/Tessin). Because this habit is named for primarily Alpine occurrence, the incident of it IN ARKANSAS makes it more rarely seen.